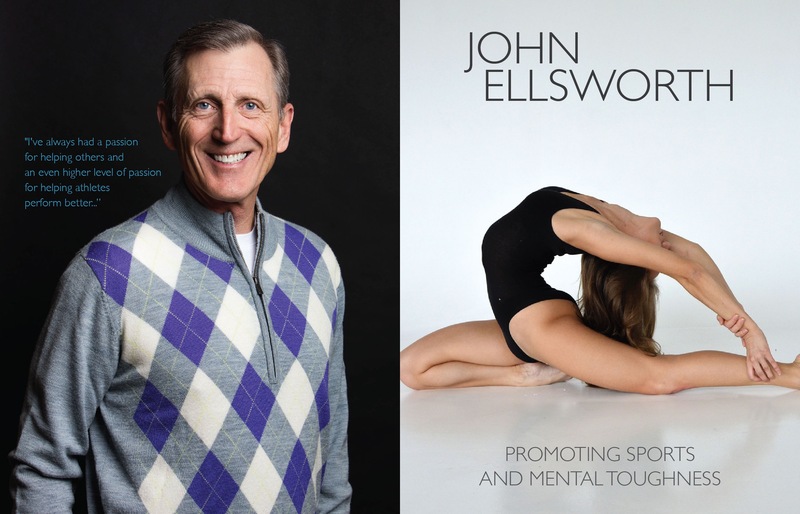 “I’ve always had a passion for helping others and an even higher level of passion for helping athletes perform better,” says John Ellsworth, who for the last 16 years has been a sports psychology mental game coach for athletes. According to Ellsworth, licensed therapists, can work with individuals, and athletes from a clinical perspective. Educated and trained individuals in sports psychology, can work as mental game coaches and focus working with athletes primarily from a performance perspective, which has always been John’s approach. Ellsworth was looking for a career change away from the technology industry in the early 90’s. He wanted to get back to a much earlier career in teaching and coaching so he decided to go back to school and get an advanced degree in psychology. His early training was in clinical family psychology and counseling, and later moved into sports psychology. While he started his career working only with families and children, he soon got referrals to work with athletes which allowed him to incorporate his life-long love of sports and coaching. 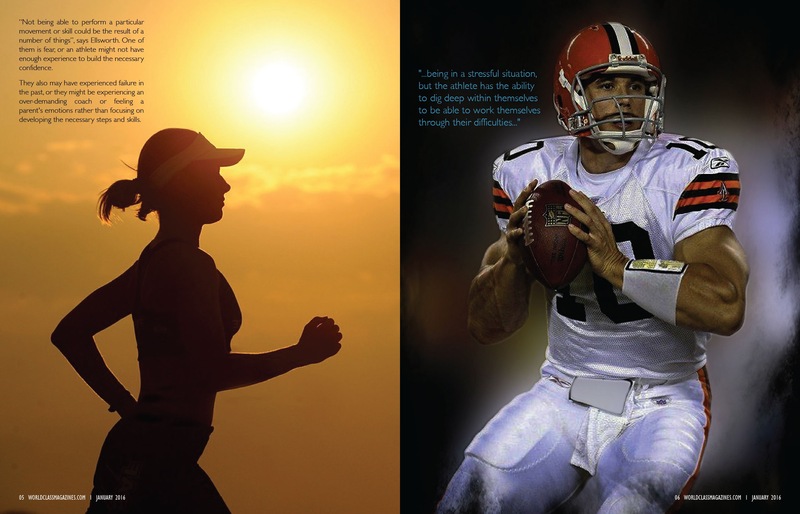 He continues to work with athletes of all ages, and skill levels, including professionals in the NFL, MLB, Professional Golf, as well as USA Track and Field that may perform well technically, but they have difficulties with practice situations, or challenges with self-confidence, focus or performance anxiety. Even when athletes possess a bunker crop of skill, they also need a strong mental game to increase their chances of winning. 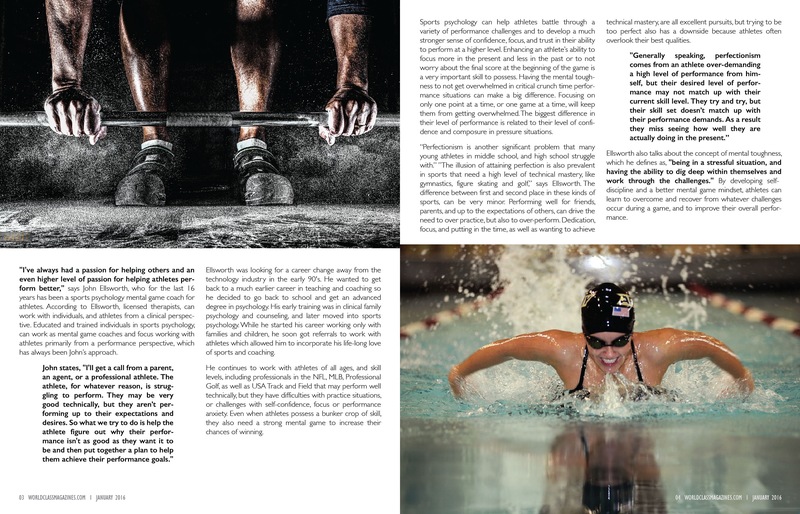 Sports psychology can help athletes battle through a variety of performance challenges and to develop a much stronger sense of confidence, focus, and trust in their ability to perform at a higher level. Enhancing an athlete’s ability to focus more in the present and less in the past or to not worry about the final score at the beginning of the game is a very important skill to possess. Having the mental toughness to not get overwhelmed in critical crunch time performance situations can make a big difference. Focusing on only one point at a time, or one game at a time, will keep them from getting overwhelmed. The biggest difference in their level of performance is related to their level of confidence and composure in pressure situations. “Perfectionism is another significant problem that many young athletes in middle school, and high school struggle with.” ”The illusion of attaining perfection is also prevalent in sports that need a high level of technical mastery, like gymnastics, figure skating and golf,” says Ellsworth. The difference between first and second place in these kinds of sports, can be very minor. Performing well for friends, parents, and up to the expectations of others, can drive the need to over practice, but also to over-perform. Dedication, focus, and putting in the time, as well as wanting to achieve technical mastery, are all excellent pursuits, but trying to be too perfect also has a downside because athletes often overlook their best qualities. Ellsworth also talks about the concept of mental toughness, which he defines as, ““being in a stressful situation, and having the ability to dig deep within themselves and work through the challenges.” By developing self-discipline and a better mental game mindset, athletes can learn to overcome and recover from whatever challenges occur during a game, and to improve their overall performance. “Not being able to perform a particular movement or skill could be the result of a number of things”, says Ellsworth. One of them is fear, or an athlete might not have enough experience to build the necessary confidence. They also may have experienced failure in the past, or they might be experiencing an over-demanding coach or feeling a parent’s emotions rather than focusing on developing the necessary steps and skills. Not every child is going to be a professional athlete, but intense pressure can definitely backfire, preventing them from enjoying themselves, or causing them to drop out of sports entirely. 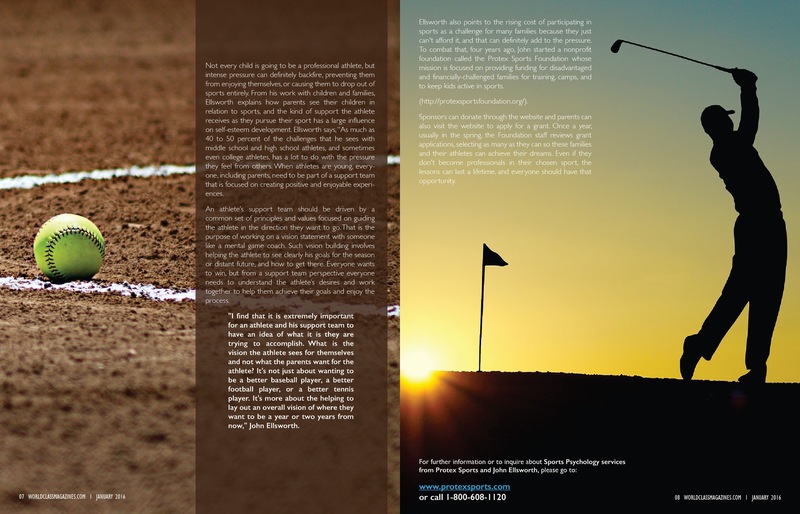 From his work with children and families, Ellsworth explains how parents see their children in relation to sports, and the kind of support the athlete receives as they pursue their sport has a large influence on self-esteem development. Ellsworth says, “As much as 40 to 50 percent of the challenges that he sees with middle school and high school athletes, and sometimes even college athletes, has a lot to do with the pressure they feel from others. When athletes are young, everyone, including parents, need to be part of a support team that is focused on creating positive and enjoyable experiences. An athlete’s support team should be driven by a common set of principles and values focused on guiding the athlete in the direction they want to go. That is the purpose of working on a vision statement with someone like a mental game coach. Such vision building involves helping the athlete to see clearly his goals for the season or distant future, and how to get there. Everyone wants to win, but from a support team perspective everyone needs to understand the athlete’s desires and work together to help them achieve their goals and enjoy the process. “I find that it is extremely important for an athlete and his support team to have an idea of what it is they are trying to accomplish. What is the vision the athlete sees for themselves and not what the parents want for the athlete? It’s not just about wanting to be a better baseball player, a better football player, or a better tennis player. It’s more about the helping to lay out an overall vision of where they want to be a year or two years from now,” John Ellsworth. Ellsworth also points to the rising cost of participating in sports as a challenge for many families because they just can’t afford it, and that can definitely add to the pressure. To combat that, four years ago, John started a nonprofit foundation called the Protex Sports Foundation whose mission is focused on providing funding for disadvantaged and financially-challenged families for training, camps, and to keep kids active in sports. (http://protexsportsfoundation.org/). Sponsors can donate through the website and parents can also visit the website to apply for a grant. Once a year, usually in the spring, the Foundation staff reviews grant applications, selecting as many as they can so these families and their athletes can achieve their dreams. Even if they don’t become professionals in their chosen sport, the lessons can last a lifetime, and everyone should have that opportunity.